Luxembourg is a member of the Benelux countries along with the Belgium and the Netherlands. It is among the smallest countries in the world (definitely among those that are real countries – as in not Vatican and such – and are not island nations). It’s also the world’s only remaining sovereign grand duchy, which means it’s a monarchy ruled by a duke and has the world’s highest nominal GDP per capita. Despite being so small there are three official languages: German, French and Luxembourgish, the latter of which is related to German (but with French influences) and has several distinct dialects. The Luxembourgians are proud of their cousine and the tiny country currently boasts a whopping 13 Michelin-starred restaurants (though only one has multiple stars). The cuisine has been influenced by both Germany and France and to a lesser extent also some other European cuisines. While the country is landlocked, they do eat fish, caught from rivers. They have some delicacies of their own, though most are sausages or other types of meat or cheese. The traditional green bean soup contains bacon and even the nettle soup recipe I found had meat stock. Potato pancakes and other potato dishes are common. Fruit pies, especially plum but other fruits too, are very popular. This recipe caught my attention because of the chestnuts. I had tried making a chestnut-based dessert before, but I had used the chestnuts on sale in Finland. Bad idea. They’re extremely starchy so I ended up adding tons of water but still the result was like glue. Only after moving to the Netherlands did I find out that the chestnuts sold elsewhere are much more sugary than starchy (perhaps just fresher). Here I played safe and used canned chestnut puree, which took some time to find, but I was determined that they do sell chestnut puree in the Netherlands and finally I found it in AH XL. The recipe did feature eggs, separated eggs, but I thought it probably wouldn’t pose a problem. I’ve become quite handy at using commercial egg replacers (I never use them unless adapting a recipe and even then very rarely, though) and their benefit is that they can be whipped to some extent (you can also whip stuff “eggs” using agar and various other gelling agents, but this is easier). However, my croquettes turned out to be very soft and mushy. Yeah, might have been something to do with my egg replacer (or maybe my croquettes were too large, maybe they should be fried for longer, or maybe the original recipe isn’t right, that’s possible too). I added the corn starch to the recipe after making it and made some other modifications, so hopefully they will hold together better with it. With a better texture they would be quite nice (the thick coating did fry up very nice and crispy). The photo session was also frustrating. 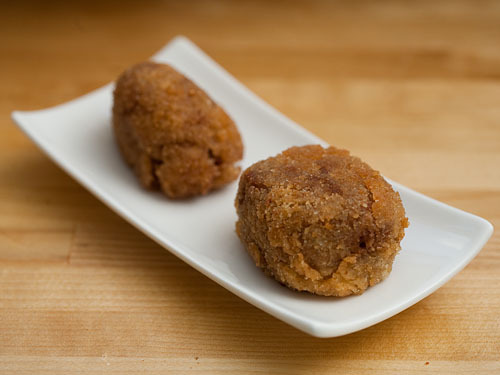 I tried to dress the croquettes with agave syrup, but I hardly ever use it, so I didn’t remember it’s so runny. Whoops. Then I tried a Dutch pancake syrup, but it, too, was too runny and just made the croquette look slimy and formed a puddle under it. That’s when I got too frustrated and gave up. :-P So, this is a very minimalistic approach, but you can imagine all kinds of drizzles and tuiles and flowers there. Combine the egg replacer and the tofu or soy yoghurt. Beat until it somewhat stiff and forms peaks. Cream together the eggs and the sugar (in a separate bowl, or just scoop the “egg” mixture into another container, no need to wash the bowl after that). Add 1/3 of the egg mixture to the sugar mixture and beat to combine. Combine this mixture with the chestnut puree and chill in the fridge for at least two hours. Form into small balls, roll in the remaining egg mixture and then in the bread crumbs. Deep fry in the oil in a skillet or deep frying pan until golden brown. Serve as they are or with syrup. Makes 3-4 portions. This entry was written on May 21st, 2011 by Maija Haavisto and filed under Desserts and sweets, Europe.